Founded and directed by José Carlos Mariátegui, the Peruvian magazine Amauta was one of the most influential cultural and political periodicals of the early 20th century. The exhibition follows Amauta’s development as a platform to explore the diversity of the avant-garde artistic production in Peru, Argentina, and Mexico and the debates that shaped the art of Latin America during the 1920s. This exhibition, co-organized by the Blanton Museum of Art of The University of Texas at Austin and Museo de Arte de Lima, addresses the avant-garde production of a vast network of artists and writers connected with Amauta. 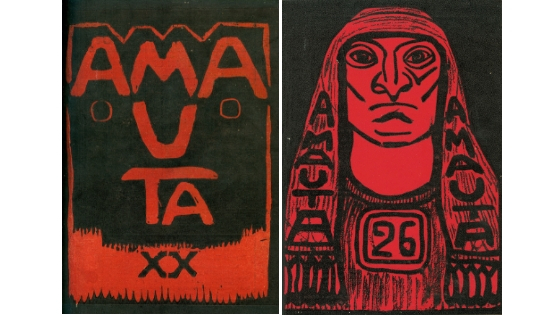 The Avant-garde Networks of Amauta: Argentina, Mexico, and Peru in the 1920s is organized by the Blanton Museum of Art and the Museo de Arte de Lima. Major funding for the exhibition is provided by The Diane and Bruce Halle Foundation. Generous funding also is provided by Jeanne and Michael Klein and PromPerú, with additional support from Sarah and Ernest Butler. Cover of magazine Amauta, no. 20, January 1920. Cover of magazine Amauta, no. 26, September – October, 1929.